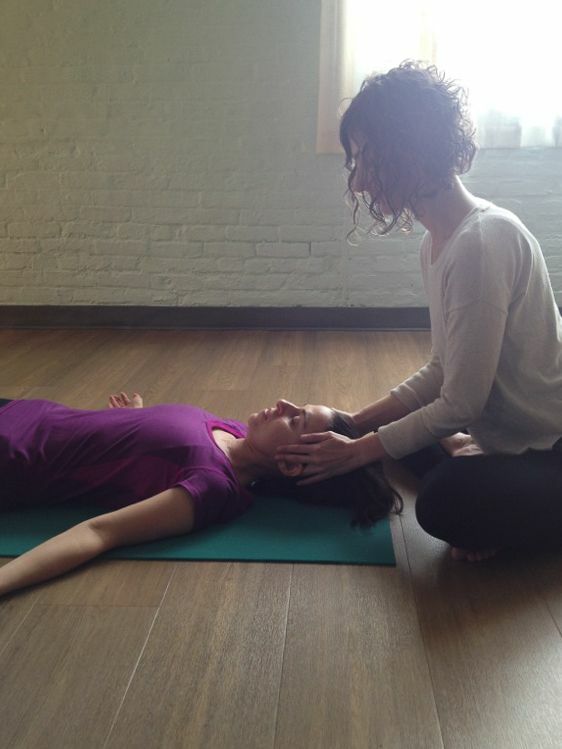 On students who are reclining in any long-held restorative pose, like savasana, and who have given consent to hands-on assists, you might consider using these eight light touches inspired by craniosacral therapy, a gentle form of bodywork, in order to deepen their relaxation and perhaps even to enhance their overall wellness by inviting a subtle inner recalibration to take place. That fluid pulses in a rhythm distinct from respiration and circulation. Of the mysterious origins of this movement, Turzi said, “Although there are many theories, I believe it moves because it’s fluid in a semi-closed system in a semi-elastic container on a revolving planet, and like all the water on the planet, it is affected by the gravitational forces of the sun and the moon.” The craniosacral rhythm can and should affect all the tissues and bones of the body. Turzi compared its movement, which is ideally bilaterally symmetrical, to “the slow beating of butterfly wings.” Often, however, there are distortions in the craniosacral path and rhythm. Craniosacral therapists believe that a light two-handed touch, applied to the body’s paired bones (for example, the two heels, the two sides of the pelvis, the two shoulders), enhances the nervous system’s own ability to observe itself—to notice, for example, differences between the right and left—and make the self-corrections that will channel fluid and movement more evenly through both sides of the body. They claim that such releases are felt not only by the nervous system, but by the many systems of the body with which the nervous system interacts. According to Turzi, “The digestive, endocrine, immunological, excretory, and circulatory systems all benefit from craniosacral assists.” When these systems work well, the body's innate abilities to heal itself are enhanced. The Upledger Institute Clinic promotes CST’s value as part of the treatment for a variety of health problems ranging from migraines, neck and back pain, ear infections, and temporomandibular joint disorders (TMJ), to Alzheimer’s, amyotrophic lateral sclerosis (ALS), autism, Crohn’s disease, post-traumatic stress disorder (PTSD), and depression. Yoga teachers, already attuned to subtle inner sensations and in the business of facilitating well-being, are uniquely well-situated to offer a light and potentially healing touch to receptive students. 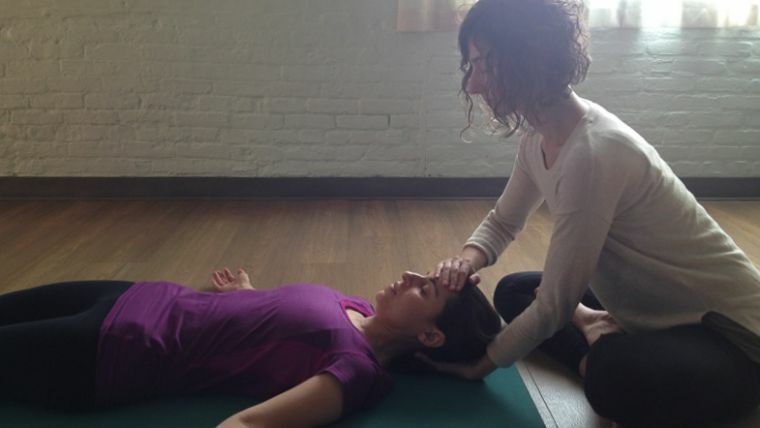 To “assist” the craniosacral system, place two hands on mirroring places on a relaxing student, using a touch “no heavier than five grams, the weight of a nickel,” Turzi says. Unlike yoga adjustments, which are often directive or corrective, craniosacral adjustments impose nothing: the intention of the practitioner is to inquire and allow. When giving an assist, keep your hands at one latitude of your student’s body for a few minutes, or until you sense that a shift has taken place. “You know it’s working if you perceive twitches, a change in rhythm, a deeper breath, a yawn, a change in pulse, or pulse where you don’t expect it. Or you might just notice an inner stilling or softening,” Turzi says. 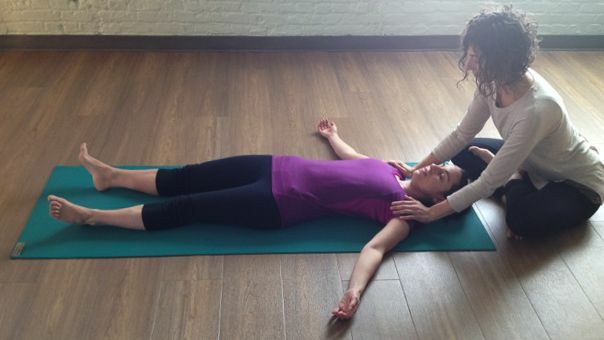 Below, Turzi demonstrates eight craniosacral assists that you could give to yoga students in savasana or similar poses, though an assist can be given anywhere the body seems resistant to movement. To get comfortable with these touches and to understand their subtle effects before taking them into the studio, you might want to practice them on a friend, and let that friend practice them on you. 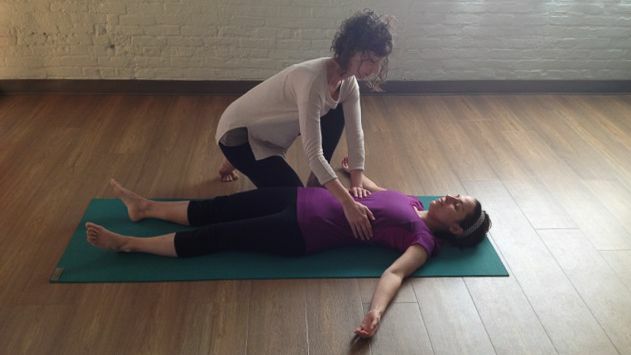 Because of the intimacy of touching a student for a length of time, only perform these assists on students who are familiar to you, or after having explained to your students that you are going to be gently laying your hands on a few specific locations on their bodies, and staying there long enough to encourage the craniosacral system to recalibrate itself. They need do nothing but relax. While giving your attention to a student, be sure to always take care of yourself, keeping your spine long and your shoulders back. 1. Hands on Heels. To facilitate the symmetrical relaxation of the heels and feet, sitting below a student’s feet, cup her heels. 2. Hands on Tops of Feet. To facilitate the symmetrical relaxation of the tops of the feet and arches, sitting below a student’s feet, lay your palms across the tops of her feet, fingers softly resting on the outsides of her feet, thumbs touching the inner arches. 3. Hands on Thighs. To facilitate the symmetrical relaxation of the thighs, sitting or genuflecting at one side of the student, touch the center of her thighs, fingers turned in whichever direction is comfortable for you. 4. Hands on Hips. To facilitate the symmetrical relaxation of the pelvis, sitting to one side of the student, touch her frontal hip bones, fingers aimed in any direction comfortable for you. 5. Hands on Front Ribs. To facilitate the symmetrical relaxation of the lower ribs, sitting to one side of the student, touch the lower front ribs, fingers pointing in the direction most comfortable for you. 6. Hands on Shoulders. To facilitate the symmetrical relaxation of the shoulders, sitting by the student’s head, place your hands on her shoulders, pointing your fingers downward toward her feet. 7. Hands at Sides of Head. 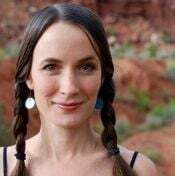 To facilitate the symmetrical relaxation of the head, sit behind your student’s head, make “Spock hands,” and cup the sides of her head, dividing your middle and ring fingers on either side of her ears, your fingertips pointing toward her jaw. 8. Hands at Front and Back of the Head. To facilitate the symmetrical relaxation of the head, sit behind a student’s head and bring one palm to the forehead, placing your other palm directly behind it at the back of the skull, fingers pointing in opposite directions.